Each month I will describe sights of interest in the night skies of South Carolina. These sights will be broken down into three sections: what you can see with the naked eye, with binoculars, and with a small telescope. The best time to view the night sky is at and around the times when the Moon is not visible, what is known as a New Moon; which will occur this month on October 18th. For October, your best viewing nights will be from October 9th through October 23rd. 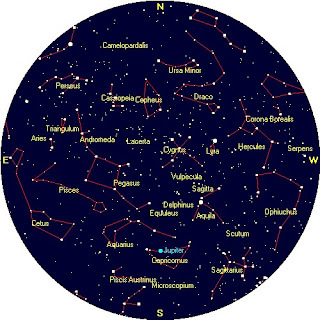 The Star chart below is set for Florence, SC on October 15th at 10 pm. Jupiter: As of this writing, there is still significant humidity present in the night skies. As I mentioned last month, October may give us some clearer viewing of the planet Jupiter. So keep trying to find the “perfect” night to view the clouds bands of Jupiter. 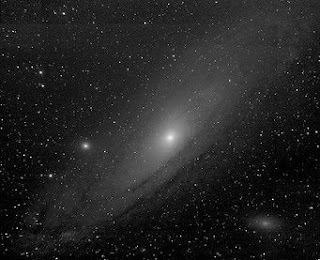 The Andromeda Galaxy: October and November are great months to view the Andromeda Galaxy, also known as the Andromeda Nebula, and Messier 31 (M31). 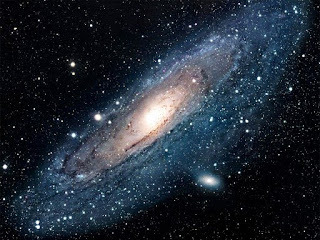 The Andromeda Galaxy is 2.5 million light years away, and is the farthest object that the unaided human eye can see. It is also the closest spiral galaxy to our Milky Way. Most recent data show that it is twice the size of our Milky Way. 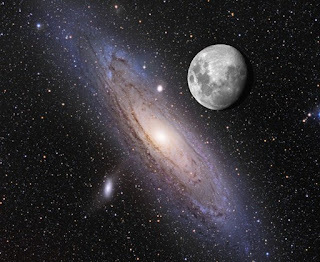 Another interesting fact is that the Andromeda Galaxy is blue-shifted. You may remember the term red-shift. When an object moves away from us at very high speeds, the light we observe shifts toward the red end of the spectrum (Doppler Effect). Most deep sky objects show a significant red-shift, demonstrating that the universe is rapidly expanding. However, the Andromeda Galaxy’s blue-shift means that it is headed right at us, and present data shows that the Andromeda Galaxy will collide with the Milky Way in about 2.5 billion years. The speed that we are approaching each other is 190 mi/sec, or 11,400 mi/minute, or 684,000 mi/hour. So every day we get over 16 million miles closer to collision! 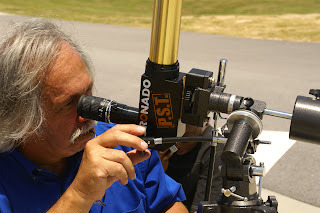 So how do you observe the Andromeda Galaxy? Since you know you can see it with the naked eye, use the chart below, or other charts on the Internet, and try to find the Andromeda Galaxy using only your eyes. It is really easy to see if you can get away from the city lights. The chart below on the left shows the southeast at 10 pm on October 15th. Start by finding the “W”, Cassiopeia, and then move right to the “Great Square of Pegasus,” and finally work your way down the long “V” of the constellation Andromeda. 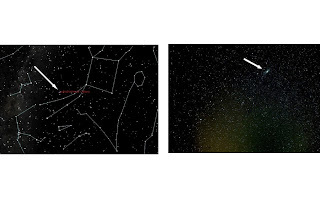 The image on the right shows how you may see the Andromeda Galaxy with the naked eye at a very dark viewing site. Next try to view the Andromeda Galaxy through a pair of 7 to 10 power binoculars. 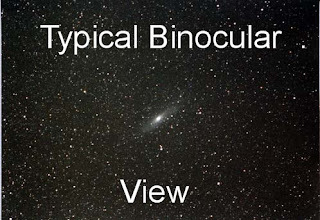 Using simple binoculars will allow you to see the Andromeda Galaxy, even with some city lights around. Most people who have seen the Andromeda Galaxy saw it through simple binoculars, or with low power telescopes, and it looks similar to the image shown below. Now for some surprises: Let’s look at a typical professional astronomer’s image of the Andromeda Galaxy, shown below; wow! Looking at the two images above, one would logically conclude that the galaxy is just so far away, that the binoculars are just not powerful enough to see the Andromeda Galaxy as the professionals can. So one day you may advance in your hobby, and invest in a more powerful telescope, maybe like our 10-inch Dobsonian. Then you crank up the power, look at the Andromeda Galaxy and surprise, it will be a little bigger, but it still looks similar to what you saw with your simple binoculars! At this point, you may be confused. Allow me to explain. Your binocular view as shown above, is not a distant view of a large galaxy; it is the view of the bright central core of a large galaxy. Even at 2.5 million light years away, a spiral galaxy measuring 200,000 light years across fills an impressive piece of the sky. Such an object would span at least seven Moon widths! Due to the low surface brightness of the Andromeda Galaxy, we don’t see the full diameter. If the Andromeda Galaxy was brighter, and our Moon passed near by, the image below is what you would see through your binoculars! So, can you see the Andromeda Galaxy this large, (of course without the bright Moon in the way) using only amateur equipment; yes. First, stay away from high power, the galaxy is just too large; stay at 20 to 25 power. Next you need significant light gathering, so a small narrow refractor will not do. A large Dobsonian has a lot of light gathering, but it has too much power. Finally, if you can use two eyes instead of one, you will have even a better shot at success. All these suggestions add up to a 20 to 25 power pair of binoculars with 70 to 100 mm objective lenses as your best equipment to see the full expanse of the Andromeda Galaxy. The last requirement is out of your control, a clear night with a transparent atmosphere. If it is the “perfect night,” you might be able to succeed with just a pair of 7 or 10 X 50mm binoculars. On a personal note: The image below represents the actual view I saw through my 25 X 100 mm binoculars in October 2003 at a campground star party only 40 miles north of the city of Philadelphia, PA. It was after a storm front had moved through, and it was indeed the perfect night. It was the only time in my life of viewing that I saw the entire Andromeda Galaxy. Naked Eye Sights: Try for a naked view of the Andromeda Nebula. Binocular Sights (7 to 10 power): The Andromeda Nebula. Jupiter’s moons.